Part 2 - Is The Bible Reliable? 2 Peter 1:16 (NLT)For we were not making up clever stories when we told you about the powerful coming of our Lord Jesus Christ. We saw his majestic splendor with our own eyes. Acts 2:32 (NLT)God raised Jesus from the dead, and we are all witnesses of this. 1 John 1:1-2 (NLT)We proclaim to you the one who existed from the beginning, whom we have heard and seen. We saw him with our own eyes and touched him with our own hands. He is the Word of life. This one who is life itself was revealed to us, and we have seen him. And now we testify and proclaim to you that he is the one who is eternal life. He was with the Father, and then he was revealed to us. 43 sources and authors mention Jesus, and all of them reveal a storyline congruent with the New Testament. We have 10 known non-Christian writers who mention Jesus within 150 years of his life. By contrast, over the same 150 years, there are nine non-Christian sources that mention the Roman emperor Tiberius Caesar at that time of Jesus. Jesus is mentioned more than the Roman emperor if we just look at non-Christian sources. If you include Christian sources the numbers are even more inflated Jesus is mentioned 43 times to the emperors 10 times. The Iliad by Homer has 643 copies. Plato’s Republic has 7 copies. 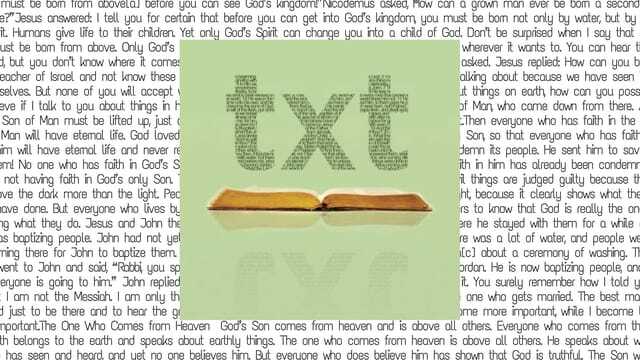 The New Testament has nearly 15,000 copies. The earliest discovered manuscripts of Homer’s Iliad is about 500 years, others have gaps of about 1,000 years. The New Testament gap is about 25 years. The odds of these eight specific prophecies happening to one person are 1 in 1,000,000,000,000,000,000. Meet the Connect Group leaders in the Café after the service. All participants receive a coupon for a FREE item from the Café.